When David Neave (Owner, Braidwood Building Contractors Ltd) called us two weeks ago, his website project was in a mess. A meeting with the team at Optimise Web and a week then on, his website is rescued, designed, and launched. David had been approached by two website designers. One of them sold the idea of a website but never got on with delivering it and the second one kept emailing web jargons and didn’t go beyond corresponding. Once again, a bunch of wannabe web designers have ruined the reputation of serious website solution providers such as ours. When David came to meet us, he seemed too doubtful and wasn’t ready to trust us. I had a look through the files and images that he brought along and thought the entire project would be a fresh and fun experience to work on. David couldn’t understand why those two designers failed to put together a decent website when all the images and content were ready and available on disc. Web design is like the self help industry. You can live 60 years and teach out of experience or alternatively take the easy route by brushing through the bestselling books under the self help category. Our confidence that we could deliver David’s website in a week put him at ease and he signed up with us. We at Optimise Web know the web trends up to the latest minute. The code for the new website was written from scratch, based on a content management system. This would enable the website to have high-end search engine optimisation features and provide greater flexibility to control the content. Three different image effects were used to compile the entire gallery. We even resized and optimised all the images for faster downloading. In four days the website for Braidwood Building Contractors was sparkling new and ready to go live. 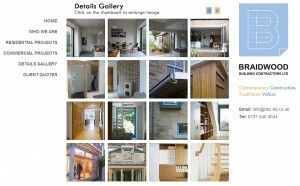 David showed his website to the architects that he works with and they loved the look and feel of his new website. We now have a happy customer and have once again proved that building websites need not be a complex task. Optimise Web believes in providing honest web solutions that deliver results. If you are not happy with your current website/provider or think that you are paying way too much, give us a call (0131 448 0483) and we can help you with the right solution that your business needs. great website , except I want to send something to David and can’t find an address!